This entry is called her Cairn Necklace which was inspired by the stacks of stones traditionally placed on paths and hilltops by walkers. The colors reflect the ones she sees on a beautiful summer’s day on Scotland’s west coast. 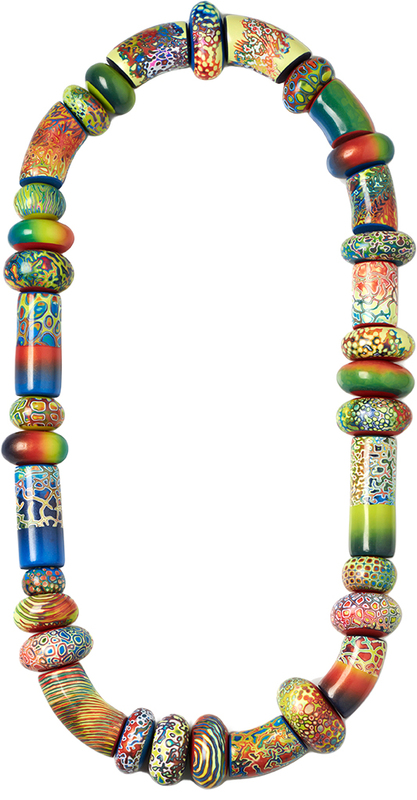 The beads are all hollow which makes the necklace easy to wear despite the size and length. You can see the other two entries, Arrowheads and Flight Waves in her Facebook photos and on her website. Be on the lookout for her new shapes and textures as well. She’s added several new designs and sells them on her Etsy site. Melanie teaches her Rock Cuffs in a popular downloadable class at Craftcast and she’s preparing a second session on 3D Beads for a May debut. Five lucky readers have won a copy of the Fire issue of From Polymer To Art magazine. Watch for it in the mail Cindy Bielefeldt, Laura Lee, Ashleen, Alene Cope and Randi Bystrom! Congratulations. In addition to all of the BEAUTIFUL jewelry pieces featured on Melanie’s site, her website is very cool. I like the way you can touch the pictures and they flip over to reveal notes behind them. I viewed it on my phone and the website loaded really fast and was really easy to navigate. Melanie, I saw you the other night on the Craft Cast Free Webinar and just loved your templates. Took a quick hop over to your Etsy shop right after it was over and drooled over all your designs. Your texture plates are stunning! I agree with Rebecca Watkins that your website is beautiful, as well. Clean and sharp, very easy to navigate. Congratulations for being featured in PCD today and Good Fortune with the SOFA show! Good luck in the SOFA show Melanie, this piece is stunning! Cynthia, thank you so, so much for such a wonderfully comprehensive post on all that I am getting up to! It has been a lot of work but I would really encourage others to set themselves a similar creative challenge if they can – aiming to take that next step up, no matter what stage they are at. I feel I have learned so much in the process of really pushing myself and it has fired up the flame for further ideas. Thank you for all your support and thanks also to everyone for their lovely comments on FB. Melanie, I went to the link for your Facebook Images and WOW! I saw this vessel you had constructed using your lovely nature inspired color elements. This is a wonderful direction for your beautiful voice. I hope you explore it more.